If you are looking to pamper yourself and indulge in a relaxing environment, a salon day out at Scent – the luxury salon is a must. Scent has a neo classical architecture theme and is located on the first level of a lovely building in Lavelle Road. Once you enter, it is impossible to miss the aroma of essential oil that wafts through the space. 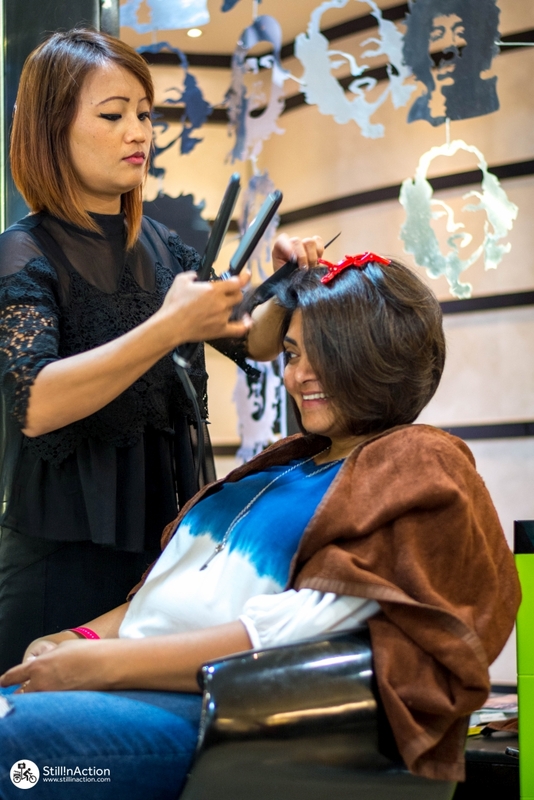 All the services at Scent are designed to pamper you and the distinctive combination of the experts coupled with well-known brands such as L’Oréal, Kerastase, Moroccan oil, Jansen and Iraya makes this place a great salon choice. Interestingly, the salon has its own line of handcrafted, organic beauty products called ‘all about myself’ that is also retailed exclusively at the salon. They also have a women’s special promotion every Wednesday called “gals pamper party” where ladies get upto 50% off on prior appointments. I decided to opt for the organic pedicure here as the manager Dinah said it was a relaxing regimen. And considering that I had been working continually, I saw this as a good way to relax. I was first given a change of foot wear and Caleb my therapist from Mizoram stated my organic pedicure by first removing my old nail paint and filing the nails in a nice round shape. He then applied a cuticle cream covering the entire cuticle and allowed by feet to sink into warm water with a pedi soak and also a lavender pedi bomb from the ‘All About Myself’ brand. These organic bombs have Epsom salt, kaolin clay and lemon salt and dissolve in water. He then used a cuticle pusher to clean the cuticles and a cuticle cutter to cut the extra cuticle growth. After this my legs were put back to soak for a while. Using a metal scrubber he then scrapes off all the stubborn dead skin. Again my feet were left to soak in the water and then again scrubbed with a wood scrubber. The front of the foot is also scrubbed clean for surface impurities. Mixing together an in-house coffee and cocoa scrub and shampoo together Caleb then massaged my lower legs and feet to leave my legs feeling smooth, radiant and the skin felt even toned. Washing my legs with warm water he then applied a fragrant sandalwood mask all over my lower legs and feet to help remove tan. After the mask dried in about 10 minutes a hot towel is wrapped around my legs and the mask is wiped dry. He then applied olive oil and using his fingers and hand thoroughly massaged my legs. This massage was very relaxing as the synchronization of his hands and the pressure applied was quite perfect. The oil was wiped out with a towel and a nice coat of nail paint of my choice and my feet felt ready to be up and running again. After checking my scalp and finding out about the issues I had with my hair, the team at Scent recommended that I try the Brazilnut Rejuvenating Ritual hair treatment. My therapist Fairy from Manipur started by washing my hair with a Brazilnut Oil-in-Shampoo which was infused with Brazilnut oil specially formulated for hair needing nutrition and replenishment. With a low surfactant content that enables superior oil distribution without over burdening the hair, this shampoo gives a lightweight veil of precious oil filling pores in the hair structure smoothening rough hair cuticles for soft frizz free hair with brilliant shine. After towel patting my hair, she then applies a mask. The mask for the treatment is the Brazilnut Oil Pulp Treatment infused with 1ml of Refined Brazilnut Oil Booster. The pulp treatment is a nourishing formula that provides ultimate moisturizing benefits and has anti-oxidant properties that make the hair tangibly smooth. Also the argan powder particles gently remove impurities for healthy looking hair with incredible sheen, improved comb-ability and manageability whist UV filters protect the hair from harmful UV radiation. The refined oil booster is intended to accelerate hair rejuvenation with the highest concentration of Brazilnut oil for ultimate care and opulent colour vibrancy. It also gives the hair a supreme smoothness and dramatically improved comb-ability. Starting at the nape the mask is applied taking horizontal sections emulsifying each section thoroughly. The massage done after application of the mask is invigorating and Fairy did a great job of using circular strokes to ensure that all head muscles were relaxed and rejuvenated. Using her fingers in synchronism she continued to massage my hair ensuring that the mask penetrated to the hair pores. This is followed with a neck massage as well as shoulder and upper arm massage that felt invigorating. A hot towel was wrapped around my hair to ensure that the cream mask penetrated and got absorbed into the hair follicles. After 10-15 minutes, she rinsed my hair thoroughly with water and patted it dry with a towel and applied the BC Hair Therapy Talent 10 miracle oil running her fingers through my hair. This luxuriant leave in spray has Brazilnut oil, hydrolysed keratin panthenol, antioxidants vitamin E and UV filters that intensively nourish, protect and balance the moisture content. After this she blow dried my hair and gave a finishing touch was a dash of a miracle serum oil. At the end my hair felt soft, smooth and luxuriant and it was certainly a well spent outing at Scent.